Jessica Mousseau is a copywriter & copy editor from the United States. Her work can be viewed at: www.jessicamousseau.com. New York City is known for its nightlife and the jazz clubs are among the best. The clubs range from small and intimate to large and expensive. No matter what you are looking for New York City's jazz clubs have it. At 55 Bar located at 55 Christopher St. You can expect to always find a crowd as this is a small establishment. Some of the names appearing here on a regular basis is Mike Stern, Sweet Georgia Brown, Billy Band and Wane Krants. There is a cover charge of between 5 and 15 dollars depending on who is appearing. There is also a two drink minimum. Shows on the weeknights are at 7 and 10pm. Friday and Saturday shows start at 6pm and again at 10pm. Sunday night shows are at 6pm and 9:30pm. At 131 W. 3rd St. a jazz club called the Blue Note has earned the reputation as being the most popular jazz club in the world. Some of the world's best jazz artists appear here six days of the week. On Mondays the local talent gets to show off. Reservations must be made in advance and the prices run from $25 for a seat at the bar up to $35 for a table. Show times are 9 and 11:30pm. There is an additional $5 cover charge for Friday and Saturday late shows. Brunch is served on Sunday from 11L30 until 4pm for a charge of $25. Some of the country's best jazz acts got their start here at the Blue Note. Arthur's Tavern located at 57 Grove St. is New York's longest running jazz club. Some of the jazz groups who appear here on a regular basis include Creole Cooking Jazz Band, Grove Street Stompers and Sweet Georgia Brown. There is no cover charge and show times are 7pm until 9pm Tuesday through Saturday. Dixieland jazz is played on Sunday and Monday from 8pm until 11pm. 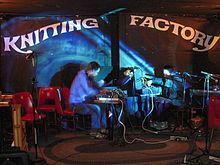 The Knitting Factory at 74 Leonard St. is a vast complex with several intimate stages. The acts that appear here are some of the weirdest in the business. Some of the names include: Sherlock's Daughter, The Babies, Monkey Pudding Face and Mia Koo. The ticket prices range from $10 to $14 and there are even free events sometimes.